Arsenal have received a double injury boost ahead of their Premier League showdown against Burnley at the Emirates Stadium. The north London side saw the end of their 22-match unbeaten run last weekend where they suffered a 3-2 defeat at the hands of Southampton and they have since succumbed to another loss to Tottenham Hotspur in the League Cup quarter-final. As such, manager Unai Emery will be eager for his team to return to winning ways and the Spaniard seems to have received a boost for the weekend with both Shkodran Mustafi and Hector Bellerin returning to training. 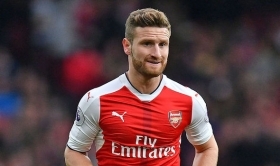 Mustafi was widely expected to return during the festive period after overcoming a minor hamstring issue but Bellerin's comeback is surely a surprise, given Emery had recently indicated that the Spaniard could be sidelined for 'some weeks'. Arsenal are currently three points behind Chelsea in the pursuit of the final Champions League qualification spot and they have the chance to pressurise their London counterparts with a victory over Burnley in the early kick-off on Saturday.